CellGenix Recombinant Human IL-6 reliably stimulates the maturation of immature to mature dendritic cells (DCs) and promotes the proliferation of cord blood derived hematopoietic stem cells (HSCs/CD133+ cells). It is produced in our dedicated animal-free facility ensuring maximum safety for optimal use in ATMP manufacturing. 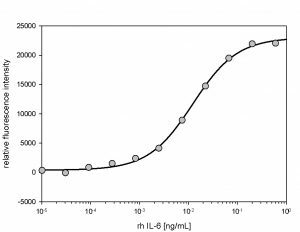 Interleukin-6 (IL-6) is a multifunctional cytokine that acts both pro-inflammatory and anti-inflammatory. It regulates acute phase responses, inflammatory reactions, hematopoiesis, bone metabolism, cancer progression and immune responses. It is produced primarily by T cells, monocytes and macrophages. IL-6 is used in the cell and gene therapy space for the ex vivo maturation of immature DCs and proliferation of HSCs. 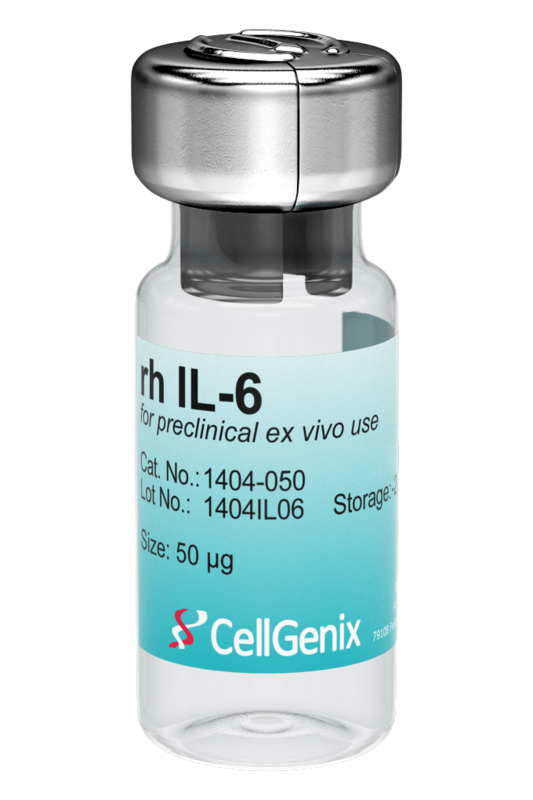 CellGenix Recombinant Human IL-6 is produced following all applicable GMP guidelines and allows for the safe use in accordance with USP Chapter <1043> and Ph. Eur. General Chapter 5.2.12. Recommended in sterile water to a final concentration of 250 µg/ml for 50 µg vials and for 1 mg vials. We recommend to not vortex the solution. The solution can be turbid, this however does not influence the activity. The activity of GMP rh IL-6 was measured in a cell proliferation assay using the IL-6-dependent cell line B9. It was calibrated against the NIBSC #89/548. 3′, 4′-Dimethoxyflavone and valproic acid promotes the proliferation of human hematopoietic stem cells.